Ah, the Yaris—Toyota’s smallest car. We own a 2007 hatchback. In some ways the 2015 is pretty much the same car we have despite the facelift. It’s got essentially the same chassis. It’s still powered by the 1.5-liter 1NZ-FE engine that also powered the 2000–2005 Toyota Echo, the 2004–2007 Scion xB and xA, and the 2007–2015 Yaris. This engine, which makes 106 horsepower and 103 ft/lbs of torque, has Toyota’s VVT-i variable valve timing system, but it’s not exactly on the cutting edge of technology. It is, however, tried, true, and nearly bulletproof. The same could be said for the available transmissions: a five-speed manual and a four-speed automatic. In a day in which most manufacturers are offering automatics with up to nine gears in their autos (or offering CVTs), Toyota still uses its steadfast four-speed auto. So why the old-school powertrain? Maybe Toyota believes that that if it ain’t broke, don’t fix it. Then again, maybe they think buyers in this segment aren't worried about the engine/transmission tech, rather, they're more inclined to offer up a super-reliable car with decent fuel economy. As I said, it's been around a while, so it's proven tech. It's also in the Toyota parts bin, so it won't cost much to make. Whatever the reason, Toyota is betting on the fact its least expensive car will bring buyers to dealerships. So while it’s the same-old Yaris in many respects, there are some noticeable changes, just not to the powertrain or suspension. Fun fact: This Yaris is made in France, not Japan. 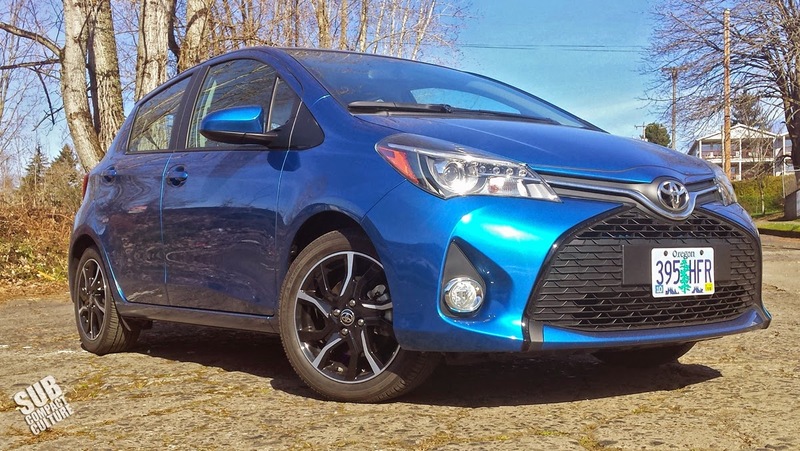 The most noticeable change from Yaris vehicles of yore is the styling, specifically the front end which looks like it was inspired by Darth Vader wearing a black Fu Manchu, or perhaps some sort of ocean creature opening its mouth for krill. Look at it and tell me I’m wrong. 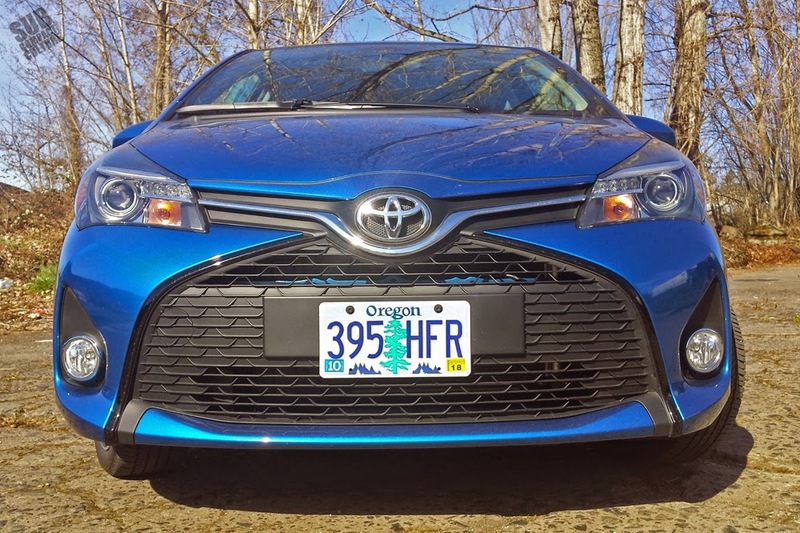 During my week with the car, I never really warmed up to the grille-everywhere design and rather busy front end. I do think it looks better in red, white, or black than Blue Streak Metallic, however. The side profile is similar to the 2012-2014 Yaris, and the rear fascia is slightly revised, too. I like the center-mounted reverse lights, by the way. The overall look (and by overall look, I am pointing to the front end) is polarizing. The interior is orders of magnitude nicer than our 2007 model, which has so much hard plastic you’d swear the interior was manufactured by Rubbermaid. 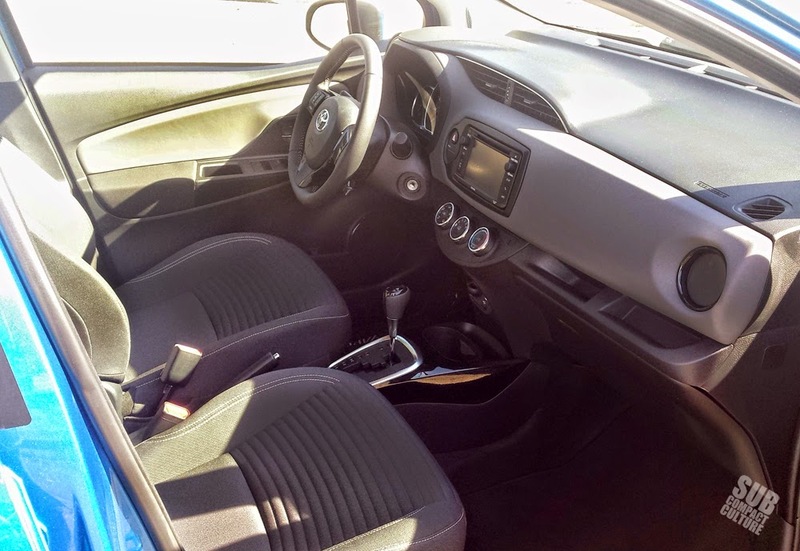 The ’15 Yaris SE has pleasing lines inside, a well-laid out dash, soft-touch surfaces throughout, and fantastic looking seats that are almost VW-esque with their horizontal pleating. Dare I say they look upscale? The seats aren’t super comfortable, but they’re not bad and have decent bolstering, although no one will mistake these for racing seats and they’re not heated. There is no arm rest and no telescoping steering wheel (although there is tilt) and it was difficult to find a good driving position. Once behind the wheel, however, you are rewarded by a fat, chunky steering wheel which features stereo and cruise controls. The easy-to-read dash features a tach, speedo, and a trip computer with temperature readout and fuel economy data. By nature, the Yaris hatchback is practical. The rear seat folds flat to accommodate scads of cargo; the back seat isn’t too bad for space, either. Two genuine adults can fit back there without too many clown car references; there’s certainly more backseat room than, say, a Ford Fiesta. Overall, the interior certainly lies on the “comfortable” side, plus it doesn’t look like it’s the least expensive car in the Toyota lineup. But beware of the cupholders. My travel mug of coffee fell out of the center-mounted cup cubbie and into the driver’s footwell while I was driving. Yikes. My mug was then relegated to the cupholder in the door pocket. Of note: the Entune stereo, which was certainly better than I was expecting, especially in an entry-level car. 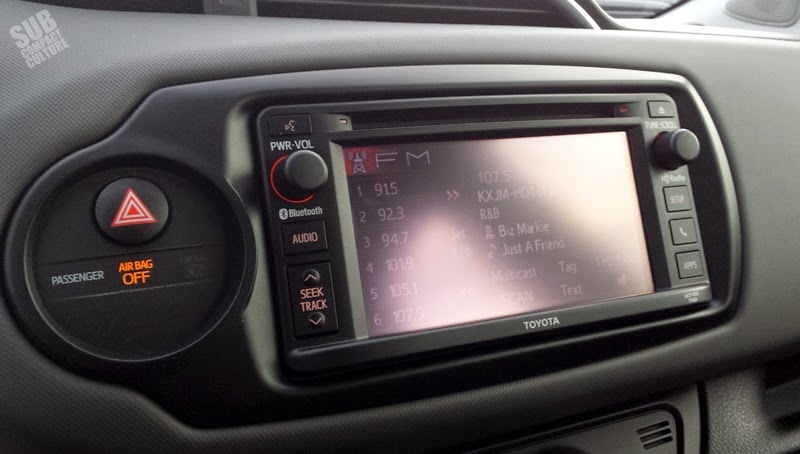 Also of note, the 6.1” touchscreen was really hard to see due to glare (except at night), as evidenced at the left. By the way, this car also featured $899 worth of optional navigation. Yes, it also has Bluetooth. Our test Yaris is the SE model, which is the sportiest version. Checking the SE box provides a sport-tuned suspension, a unique front fascia that has headlamps with LED accents; unique (albeit slightly hideous) 16” alloy wheels, and, most importantly, a faster steering ratio than other Yaris models. The trade-off with the fast steering is its turning circle is greatly increased—4.6 feet greater than base model Yaris variants. I often ran out of turns when maneuvering in tight spots, which required regular three-point turns. Compared to our 2007 Yaris it’s not as limber in town. 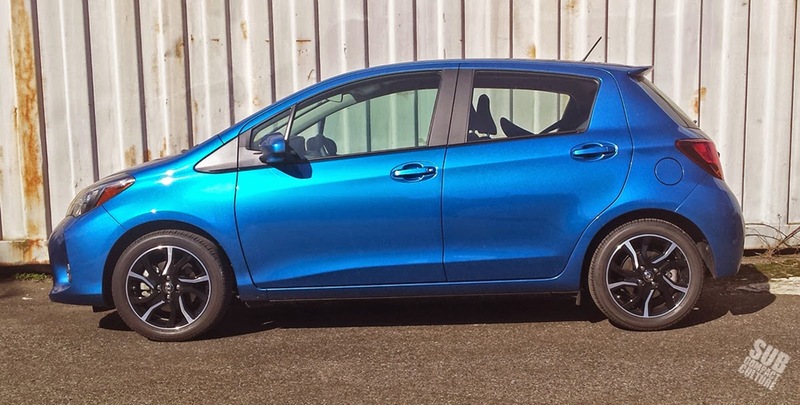 Granted, the steering is much quicker in the twisties, which gives the Yaris SE a sportier feeling than you might expect. It’s actually really fun to throw around and has better-than-expected reflexes in the curves. And despite the chassis being in its eighth model year, Toyota did make some tweaks here and there to stiffen it up, despite offering softer springs. That additional shock and chassis tuning has given this tiny Toyota a ride that’s quite impressive. It cruises interstates much better than you’d expect. However, on anything but the smoothest of tarmac, there was a really annoying rattle behind the stereo. If I owned this car, I would’ve brought it to the dealership and asked them to fix it. Dashboard rattle aside, if you were to pair the Yaris SE with the manual transmission, it’s a spry, scrappy little thing. A set of performance springs, shocks, and a TRD rear sway bar, and you’ll really enjoy twisty roads. Equipped with the automatic transmission, the fun factor is definitely kicked down a few notches. The 2015 Yaris still is rated at 30 city, 32 combined, and 36 highway MPG. How does that compare to others in the segment? Not bad, actually. The ’15 Honda Fit gets 32, 35, 38 MPG, respectively; the base Ford Fiesta gets 27, 31, 37. So it’s still competitive in that respect. Despite having only 106 hp, the car only weighs 2,335 lbs with the automatic. That’s pretty darn light, so there isn’t much heft to move around. In town, the car darts easily in and out of traffic. When pressed, however, the old-school auto saps power and fun. Floor it on the highway and there isn’t a whole lot that happens unless you count the noise that emanates from under the hood. This car would be much better with a different transmission, namely the manual. And for what it’s worth, I got a tepid 29 MPG over my week with the car. There is a decent aftermarket for the Yaris, actually. Due to the car’s global popularity and the fact that the chassis hasn’t changed since MY20007, there are all kinds of sporty shocks, struts, springs, sway bars, wheels, tires, and performance bits that can be added on. I know most buyers aren’t souping up their Yaris hatchbacks, but those people might not be reading this blog, either. The Yaris can actually be fun and sporty for very little money. And yes, there are several Yaris race cars out there. See for yourself at YarisWorld.com. No, the Yaris isn’t at the top of its class for performance, power, or size, and the looks are polarizing. But there are some endearing qualities, such as the good ride, the simplicity, and the sporty handling. Things start to get a little wonky when you look at the price, though. Our tester had a sticker price of $19,524. I’ll admit that I had to read it the price twice to make sure it was truly that close to $20,000. That’s a lot of money for this car, especially since competition is so fierce in the segment and, frankly, the Yaris lags behind in power and technology. So why would someone buy a Yaris SE over the competition? Well, they’d have to really want the Toyota reputation and want a proven powertrain. The Yaris has its work cut out for it in the B-segment. However, I believe this Yaris is probably a stop-gap until the alleged Mazda/Toyota small collaboration hits the market in 2017 or 2018. Until then the Yaris soldiers on as Toyota’s entry-level automobile. On a personal note, our ’07 Yaris has been nearly bulletproof in terms of reliability. It’s still fun to drive. It’s easy to work on. It easily gets 36–38 MPG. The new Yaris has these same traits, too. But this isn’t 2007 anymore, and there are a lot of outstanding choices in the subcompact segment. What were your thoughts on the 4 wheel disc brakes? Some say with a car this size and weight there is little if no need for rear disc (and I've contemplated switching my Yaris). Another reason to get the Yaris over its competitors is rear seat passenger room. There's nothing else that small and that sporty with that much rear seat head and leg room, and with four doors. 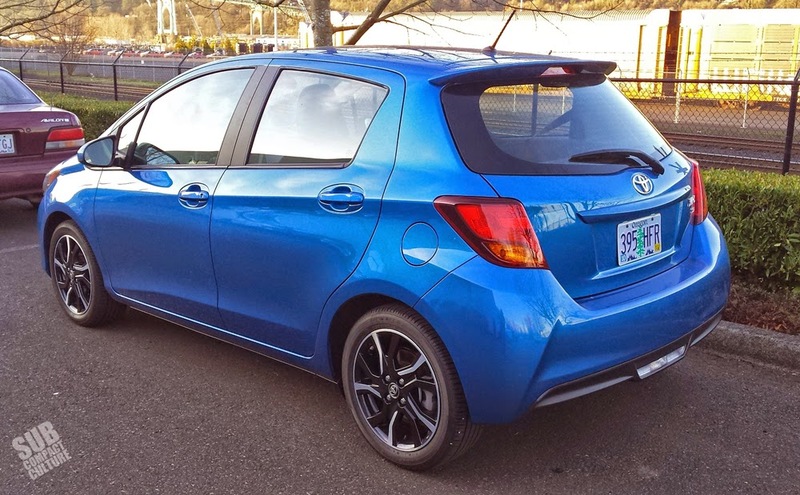 It seems to be a trade off with cargo space, but if you carry people more than luggage then the Yaris might be your best bet. Who designed that ugly front end? I'd like to smack him or her upside the head with a board. Thank you for the review! I'm just happy that they are still making the Yaris model. since I bought my 09' hatchback, I have had no problems, whatsoever. I love it. I am a horrible (well...I'll say not great) driver and this is my first car. Here in Buffalo, NY, this car appears to be fairly popular. I agree with the strong dislike of the front grille, but happen to like the alloy wheels. I have pinstriping and a body kit on mine, but I think it would look ugly on this model. In about three years when my daughter starts driving, I'll give her this car and I hope they will make 19' model.